Duivelsbier of Halle - Den Duvel zit in dat bier of het kan anders niet zijn! If you were to ask the average enjoyer of Belgian beers what a Duivelsbier was, they'd probably give some response to the effect of 'Oh, like Duvel? And those other golden strong beers with devil-themed names? Yeah, a golden-colored, strong but light-bodied beer...'. And who can blame them. I would have given the same sort of answer not too long ago. A quick flip through Michael Jackson's Great Beers of Belgium even breaks down beers following this, with Duvel and other devil-themed beers all grouped together (and there's quite a few of them). 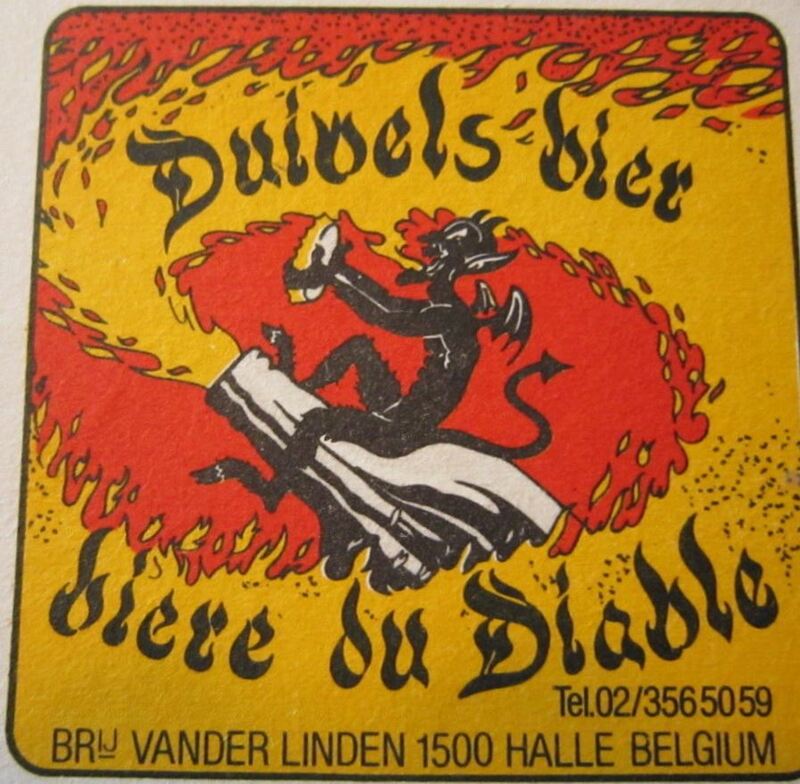 But while Duvel is perhaps the most successful of these Belgian beers with names relating to satan, it certainly didn't invent the idea. Duvel's website traces the lore of the name to a fateful passing comment by a drinker in 1923. This blog post deals with an earlier devil's beer, as presented by Frantz Stockmans (who it seems really knew his beer) in Le Petit Journal du Brasseur in 1912, but tracing a history back centuries before that. So, on to the topic of the day - Duivelsbier of Halle. Halle (Hal in French) is a city southwest of Brussels in Belgian lambic country. It is Flemish speaking, and is one of the larger towns in the area (population ~38,000 today). Jesuits had a reasonable presence in the city from at least the 1600s. Beer travelers might be familiar with Halle as the easiest way to get from Brussels to Beersel (for 3F or Oud Beersel) by train involves changing trains in Halle. Being in lambic country, lambic producers and cafes were once reasonably common in Halle, but those days are past. With them, it appears, went duivelsbier. One brewery (Boon) still makes one (see this quick blurb on lambic.info, a site you should all pay attention to if you like lambic - there is more English language lambic information there than anywhere else by a huge margin, see also this Dutch-language wikipedia page). I've not had it, but from reading online reviews and the Dutch page it seems it probably doesn't reflect historic Duivelsbier. Interestingly Vander Linden (a now-closed lambic producer in Halle) was producing the beer up until 2001, something I wasn't aware of. So while presenting the existence of duivelsbier may not be news to some, especially Belgians, hopefully some of the production methods and technical specs of circa 1900 duivelsbier are. That's a promising start to an article! (ignore the reproduction prohibited part). "Legend: Like Brussels lambic and other beers, the Duivelsbier of Halle has its history." So what is Duivelsbier? Overview and Legends: It is a dark, strong beer made from spontaneous fermentation. According to this article in Le Petit Journal du Brasseur, this beer first came around somewhere near the end of the 17th/beginning of the 18th centuries. Lore (so take this as you will) has it that the Jesuits were brewing and one day they were without yeast for the beer they had just made so they put the wort into their barrels without adding yeast, planning to blend it with their next brew some time later. But it started to ferment on its own before that time, so they left it in the barrels. A year later they took a sample and found they had a vinous beer that, when sweetened, was quite enjoyable. And so the beer was born. The name Duivelsbier came shortly after that (again, from the lore). Perhaps the author and his sources, all residents of Halle, might not be unbiased in this little dig at the visitors from Brussels, but the story goes that some Brusseliers came through and, being unused to beers of that strength, drank a bit too much. On their way back home, when they were stopped by the mayor, they blamed the beer, saying "The devil is in that beer, it can be no other way! "(Thanks to Kevin of Belgian Beer Geek for translation help! The original Flemish quote is at the top of the post). As the story goes, the name stuck and, either way, this dark strong beer of spontaneous fermentation became well-loved in Halle. Vander Linden's Duivelsbier (photo taken from a breweriana auction). Making Duivelsbier: The production for the beer is basically what one might do for lambic (excepting maybe malt color). The grist is 50-55% raw wheat with the remainder as malted barley. Based on the end color of the beer, I think it is reasonable to assume that the barley used here isn't as pale as what one might find in modern lambic. Perhaps something like a Vienna, or maybe even something like Munich, is more accurate. This is guesswork as the text just says malted barley (and the text doesn't specify multiple different malts, so I'm assuming one diastatic malt with some color). The text also says the beer is brown/amber in color and that the krausen from active primary is black/brown, suggesting that the wort is fairly dark and color doesn't come only from candi sugar added later. The OG is in the range of 1.060-1.070, with the average beer probably clustered around the middle of this. This is comparable to lambic of the time, though perhaps slightly stronger than average/on the high side (the text, at least, argues that duivelsbier was the strongest of the beers of spontaneous fermentation, coming in at ~7.5-8% abv). Though exact production methods were variable depending on the producer, the author favors a turbid mash approach, variations of which were common for many different Belgian beers (even non-spontaneous beers). The mash had 4 temperature steps, reached by infusions, of 45 C (113 F), 55 C (131 F), 65 C (149 F), and 75 C (167 F) and with turbid runnings withdrawn to a second boiler at the 55 C, 65 C and 75 C steps. The turbid runnings are boiled throughout this mashing and then returned to the mash tun to be clarified by passing through the grain bed before being transferred into the main boiler. Much like with lambic of the time (see these first and second earlier posts on lambic in the mid 1800s), later runnings of the mash were sent to the now-empty second boiler to make a lower gravity beer (called Mars, again like lambic). Boiling was 4-5 hours for the duivelsbier and 10-12 hours for the mars, comparable to lambic production. Unfortunately hopping rates aren't listed, but for now I'll guess that they are in the range of lambic given that the lactic acid levels are comparable between the two beers (though duivelsbier was a bit less acidic). After boiling the beer was sent to a coolship for open cooling, and then to barrels for fermentation. The beer sat in those barrels for roughly 24 months before it was ready. A bit of candi sugar (exact amount depends on the cafe doing it) was added to the matured beer shortly before serving. Under a microscope the microbial composition of a bottle of duivelsbier appears comparable to that of Brussels lambic, which I think is unsurprising given that Halle is central to the lambic region between many modern producers and duivelsbier was made by spontaneous fermentation. Parts of the text suggest that perhaps there was a bit less brettanomyces in duivelsbier, but I'm not personally inclined to put a lot of stock in that. The beer is described as soft in body, carbonated and easy to drink in volumes greater than you intended to. It was clear and with a color of cognac. The taste profile is described as being between Brussels lambic and a good aged Oudenaarde beer (so something in the Oud Bruin or Flemish red/brown range). Of course keeping in mind that we are talking about these beers around 1900 so we can't really compare to modern examples, this gives us some idea of the color/malt character and the way this came across in the finished beer. The sweetening with candi sugar shortly before serving may push the beer more toward the faro direction than a straight lambic. I've adapted information and tables in the text into this table of units (below) that are more easily understood. As usual, at times a mixture of units is used and there is a bit of information that doesn't seem to line up, but based on the whole of the information, here is my best guess at the most accurate values. The acid values are more clear and I have more quantitative confidence in them. Note also that some of the lambic/gueuze gravities and alcohol may not be totally representative of the range of lambic. The acidity of the beer was generally in the realm of lambic, though it was a bit less, especially for acetic acid. The lactic acid levels of duivelsbier were about 85% of contemporaneous lambic and the acetic acid concentrations were a bit over a third of those in contemporaneous lambic. The acetic levels in historic duivelsbier were comparable to modern day flanders beers, so there was definitely a noticeable amount, but it seems that, given the age of duivelsbier, brewers did a good job of keeping O2 out of the beer to suppress acetic acid production compared to historic lambic. The FGs, OGs and ABVs were generally in the same ballpark for duivelsbier and lambic (FG in the mid single digits in SG, OG around 1.065, ABV 7.5-8.2%) though some lambics of the time were a bit lower strength than this. And of course most modern lambic is lower strength than this. Duivelsbier in the modern world: I think duivelsbier is a good example of how much lambic and lambic-type brewing has changed over the last century. 100 years ago lambic was still doing comparatively well (though perhaps not as well as earlier in its history). But still, there were many producers and more 'styles' of un-fruited lambic than the one that we find now (almost every modern producer makes one lambic wort stream, though Boon does make a Meerts and perhaps their Marriage Parfait is also stronger). Historically with lambic there were two wort streams produced regularly - Meerts and Lambic, which were combined to produce faro. This was standard practice across many different breweries. In addition, we have this regional/specialty wort of duivelsbier and I wouldn't be surprised to learn that there were more worts like this elsewhere. And furthermore lambic was regularly supplied for blending into other beers to produce lambic-top fermentation blends. Some of these are coming back, which is good news. But anyway a lot was happening with lambic in terms of wort compositions and blending to yield a range of final products compared to now. Of course now we're doing pretty well for lambic with a wide range of fruiting and use of specific barrels for flavor addition. So really one was born as another faded away. So, to bring this all back together to where we began, there is one surviving duivelsbier today. One lambic producer from Halle, the now closed Vander Linden, made it until 2001. Since 2003 Boon has produced the beer, though it seems that Boon's duivelsbier has more in common with something like an abbey brown than with the historic duivelsbier. While it is good that someone is keeping the name alive, and I'm sure the people of Halle are happy about keeping a beer of their heritage around, I would be really interested to see a beer resembling historic duivelsbier today.